At Duff Family Dental, we place composite fillings directly on your tooth in thin layers, then shape and polish them until the composites bond to your tooth structure. We use a specialized light to harden each layer and speed up the bonding process. This guarantees a quick, easy procedure for you and your family. Composite fillings provide excellent durability and resistance to fractures, are less expensive than gold fillings, and do not expand and contract like amalgam fillings. Moreover, the natural coloring of composite makes it the preferred material for fillings among our patients. Until recently, dentists favored amalgam fillings (made of a mixture that includes silver and mercury) because of their strength and relative ease of placement. However, these types of fillings are not aesthetically pleasing, may corrode, and can further stain your teeth. They also require drilling into the tooth and removing some of the healthy tooth structure. We don’t believe this is ideal. Dental restorations have come a long way. Today, most fillings are made of gold, amalgam, composite, or porcelain. At Duff Family Dental, we prefer composite fillings because they are strong, natural looking, bond well to your enamel, and can be placed in a single visit. 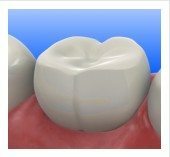 Our composite fillings are also compatible with sealants. This means that our dentists can complete both procedures in a single setting. Sealants are used to fill in crevasses on the chewing surfaces of your teeth and shut out food particles that cause cavities. A combination of composite fillings and sealants can prevent further tooth decay for you and your family. If you prefer, we can even put a clear plastic coating over your filling to prevent staining and early wear. Although uncommon, if your composite filling needs a touchup, we can repair it by adding more composite material. Its easy application, durability, and natural aesthetics make composite the preferred material for fillings among our dentists as well. Your teeth are under attack. When you eat or drink, certain types of harmful bacteria use the starches and sugars in your food to produce acids. These acids can soften and dissolve your enamel over time, leading to stains, cavities, and decayed and disfigured teeth. Let Duff Family Dental help you on the road to dental recovery. If you live in Springfield, Missouri, or the surrounding area, give us a call. We aim to provide you and your family with the best and latest in dental technology and treatment options. We offer a variety of services, including dental crowns, implants, teeth whitening, veneers, and more. Ask our qualified staff what Duff Family Dental can do for you. We’ll work with you to choose a filling that works best for your situation, and we can customize your dental restoration plan. To get started, please call us at 417-501-8601 or schedule an appointment online.